Hoarding, is more than just clutter that’s built up over time, it’s an actual disease that requires treatment, coaching and support from people surrounding the individual. When Mayken is contacted to help clear out a hoarding situation, it is usually family or friends who are providing this support that contact us and it’s due to several reasons. Most common is sheer overwhelm. And along with the overwhelm also comes the potential health and safety issues that accompany hoarding and have caused others to get involved. Many individuals caught in the cycle of hoarding often find themselves in poor health and the very hoarding lifestyle that has caused their health issues also causes a safety concern for any EMS staff that may need to enter the property to provide assistance. In many cases this also extends to the safety of police and fire personnel as access within the property is restricted, items are unstable and overstuffed and this can often make it impossible to gain access to some areas of the property further putting the property and the individuals within at risk of fires and other health risks. When Mayken is brought in to help these situations we work with the owner/occupant to clear out the clutter by starting with the obvious garbage and recyclable material while keeping an eye open for personal items, family heir looms and anything that is of value to be salvaged. Unfortunately, some items are not worth salvage as years of debris and “stuff” piled on it and walking on it can render it useless, broken, damaged or even dangerous! Worse than the overwhelming amount of items found in the home of a hoarder are the additional issues that occur. 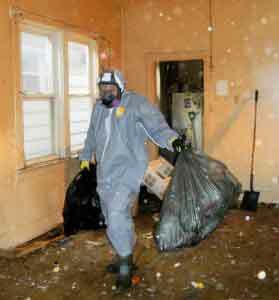 The process of hoarding also invites other hazards like mould, vermin and rot depending on the length of the issue and any compounding issues like spills, household leaks or food lost in piles. Team Mayken has encountered properties that were totally overwhelmed with mice, at every turn as items were moved, more and more mice, nests and babies were found. Along with the mice are the urine and droppings they leave on everything, causing air quality issues and resulting in most items requiring disposal regardless of their value or personal attachment. Due to these often unknown issues that are buried within the piles of items, when Mayken is engaged to help clear out a hoard, all of our staff that works inside are required to wear appropriate safety equipment due to the potential risks. This includes “Tyvek” type full body suits with hoods, N-95 masks, nitrile gloves, leather gloves and safety footwear. This is sometimes a little overwhelming to the homes occupant as they do not see the need and feel it is safe in the home. But, it is very apparent in a very short time the hazards our staff are being protected from. The masks are a heavy duty version of a dust mask and turn very dark and black over a short period of time working in the hoard. This shows what we would be breathing in if we were not protected. It could be mould, potentially ears or months of dust and dirt buildup, disease distributed via vermin droppings and much more. This protective equipment doesn’t just protect our staff on site, it also prevents the staff from being exposed to and then transferring it to their cars, homes and families. 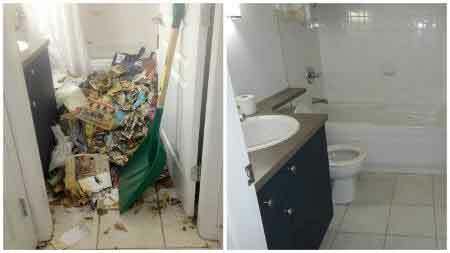 Other issues that we see are a result of hoarding are human feces as over time, most hoards render the bathrooms and plumbing inaccessible or inoperable. This usually leads to the occupant using an alternate method and location in the home causing a bio-hazardous situation which makes proper care and safety precautions even more important. Mayken has also encountered situations where the occupant has diabetes or other health issues which use needles to treat it or manage their disease or “habits”. This becomes a major concern for our team and changes how we have to deal with the property. At that point, we can no longer “dig” through the possessions as a sharps hazard now very real and the safety of our team is paramount. In extreme cases hoarding can even lead to interiors of properties requiring nearly complete gutting in order to turn them into safe environments. The multitude of both visible and hidden dangers that accompany houses that hoarders occupy is why we recommend you hire professionals such as MayKen to help protect you and to deal with the contents of the property in as safe and an efficient manner as possible. If you would like to read more on this topic, check out another article HERE. If you have a friend, a relative or someone you’re just helping out who has turned their property into a potentially dangerous environment, CONTACT US TODAY to see how we can help or guide you.